Did you happen to check out our new selection of toys?! Introducing West Paw’s Zogoflex toys. They have a few different designs, read more below to find out what each one is about. Toppl Treat Toy: Traps treats with its inner ridges and tips over to keep dogs entertained. You can also interlock the two different sizes to make play time even more of a challenge. This toy is perfect for those clever pups! Hurley Dog Bone: Is your dog a chewer? If so, these bones are what your dog has been waiting to gnaw on! They are also great for fetching, even in the water! If it gets too messy, no worries just toss it in the dishwasher. Jive Dog Ball: A bright, bouncy, durable ball made for your ball destroyers. It also fits into a standard ball-thrower. If you have a pet who can never just put the ball down, this one is made for him! Tux Treat Toy: This one is the ultimate of treat toys. 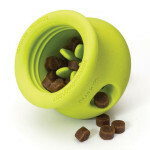 You can put any type of treat inside and let your pup go nuts. Even if emptied, the fun isn’t over. It floats, flings, bounces and can withstand some serious chew sessions. It is considered their toughest toy! Tizzi Dog Toy: It’s every dogs favorite toy rolled into one. It has a secret treat compartment, handles for tug of war, and it can be flung for fetch. Of course, it bounces and floats and can stand up to some rough play. West Paws Products are all 100% recyclable. Made in the US. and certified Safe and Guaranteed to last. Come try out a new toy today!